As the mom to a toddler, I know how quickly life can go from clean, tidy and completely under control to a chaotic hot mess. It's usually about the same length of time it takes me to use the bathroom with the door closed or clean out the dishwasher with my back turned. Every mom has her own way of handling the sticky situations that come with parenting children. Mine is the rule of 15: If it takes less than 15 minutes to clean or costs less than $15 to fix, then it's not worth getting stressed out about and we just turn it into a learning opportunity for Hannah. This rule helps us keep things in perspective. 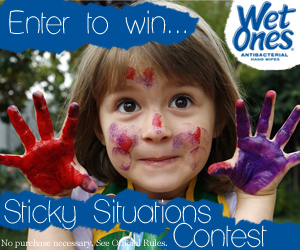 WetOnes is giving us the opportunity to share the Sticky Situations we have found ourselves in and tips on how to deal with them through their Facebook Contest! Simply log on and share your story and tips, and you can be entered to win an iPad Mini or Six Flags Tickets! I participated in a campaign on behalf of Mom Central Consulting for Wet Ones. For as long as I could remember, my favorite part of preparing for Christmas wasn't putting up the tree, but setting up my mother's elaborate nativity set. Each year we would try to find a new figurine to add to it, and now as I unbox them I can recall the stores we purchased them it, the look on my mom's face as she unwrapped it, and the placement it's been given over time within the set. Now that I host Christmas for the family, my mother has passed down the set to me, and it's my most treasured decoration of the season. Because Hannah is at an age where every decoration is up for grabs, I'm only unpacking a small portion of the nativity set, but this is an example picture of the style of my Fontanini set. Hannah was very interested in the figurines, and I used it as an opportunity to again explain the meaning behind Christmas. While the figurines aren't easily breakable, I have been discouraging Hannah from playing with them. At about $25, this set is reasonably priced. We own a few Little People sets and they are perfect for babies and toddlers alike - they're not breakable, light weight, and fit easily in tiny hands. 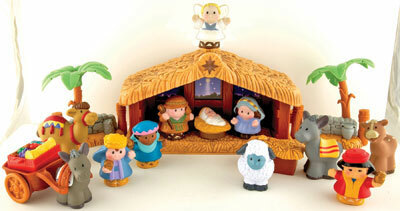 This set is also high in cute factor, and plays Away in a Manger if you add 3 AAA batteries to the stable. This price runs under $30, but I'm not familiar with the brand or the quality of their products. 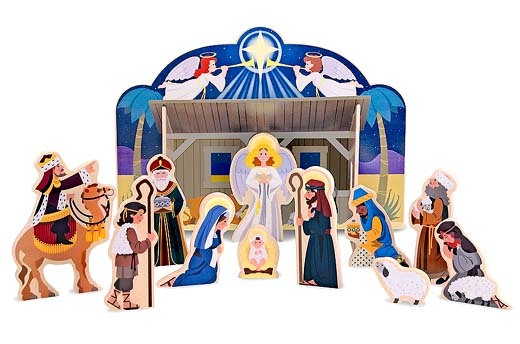 I do like that there is a stable, multiple animals and angels included. I also like that the figurines are more realistic than the Little People set. With a list price of $45, this set is probably not going to be the one I select. I like that the figurines are posable with movable arms, but I wish it included the three wise men. Coming in at under $30, this set is at a good price point, and everyone knows I love my Melissa & Doug toys. The wooden blocks are durable, I'm just not sure they're as enticing as the other sets. 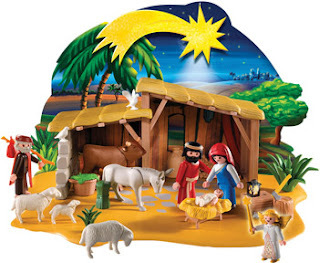 I WANT Hannah to play with her nativity set. I want it to be a toy that inspires conversations and storytelling. 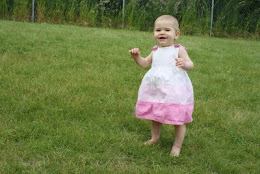 While my set is meant to be enjoyed visually, I want Hannah to be excited to play with hers. Although it's a little 'babyish', I have to admit that I'm leaning towards the Little People set. I trust the quality, I like all the animals included, and I know Hannah will respond positively to it. That said, I have a year to make up my mind and I'd love some reader feedback. Do you own any of these sets - or perhaps a different one I didn't find during my search? Reviews, both positive and negative, are welcome. I'll be 27 weeks pregnant in a few days, and so far the only cravings I've had are for clementine oranges and green apples. I blame the clementines craving partly on Hannah. She brings me 4 of them, "two for mommy and two for Hannie! ", bribing me for that I'll peel them for her. It works every. single. time. 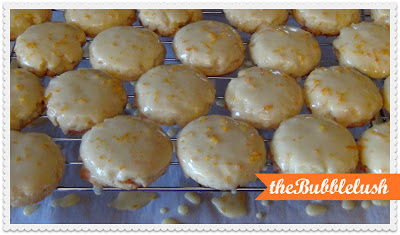 So the other night, when I was on Pinterest and saw a recipe for Orange Zested Cookies with Sweet Orange Glaze, I was a goner. I had all the ingredients on hand, so it was just a matter of time. I followed the recipe from Stephanie's Kitchen to a tee, and these cookies turned out beautifully. 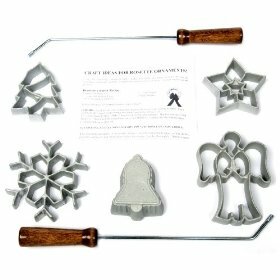 The recipe started out like most cookie recipes: The dry ingredients were sifted together in a medium bowl, and the room temperature butter was put in the mixer to cream. But then the recipe took a fabulous twist. The orange zest was added to the granulated sugar, and I mixed them with my fingertips. 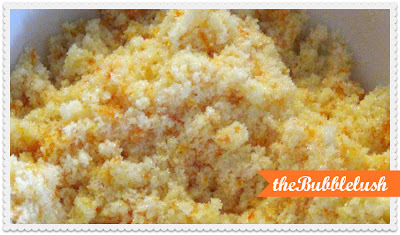 The essential oils in the zest turn regular white sugar into this light, fluffy, orange tinted sugar that smells amazing. 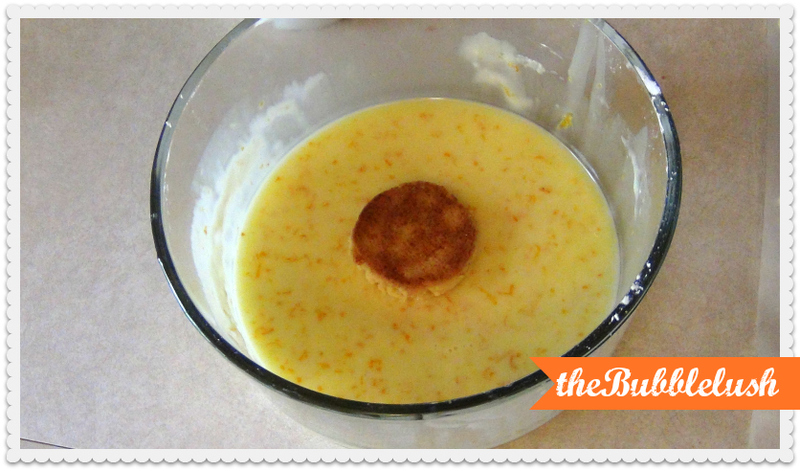 Once you add it to the butter to cream, you add some orange juice and an egg and finish creaming together. 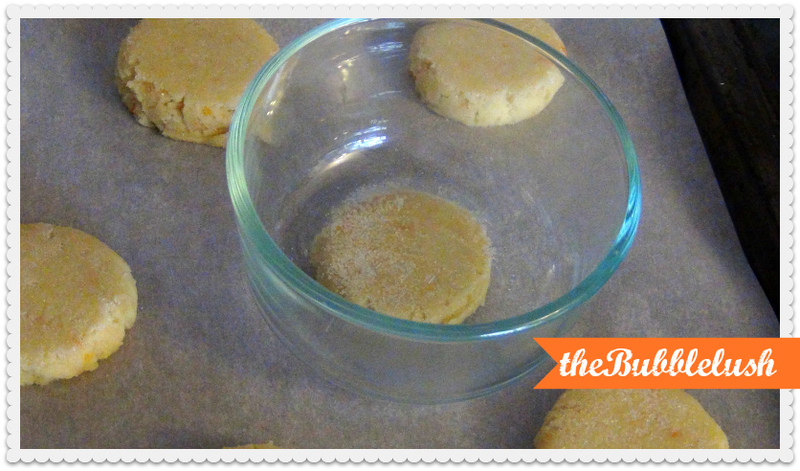 I scrapped down the side of the mixing bowl and then slowly added the dry ingredients (flour, salt, and baking soda) with the mixer on low until a sugar cookie consistency dough is formed. 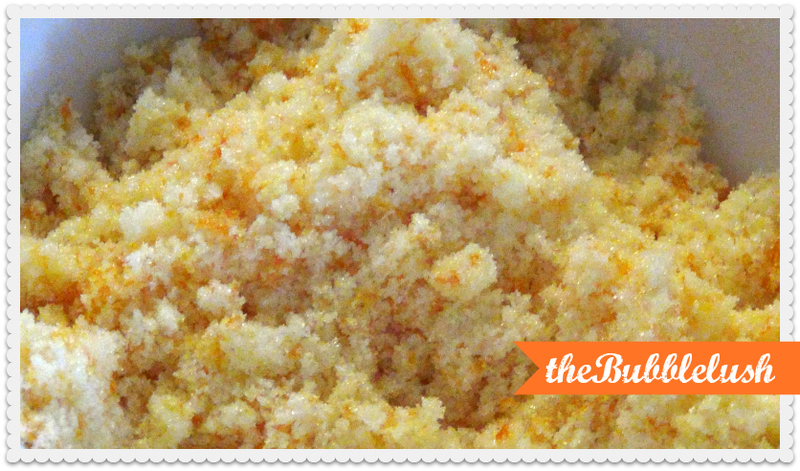 The dough is dotted with the orange zest and is slightly drier than a chocolate chip cookie dough. The oven was preheated to 350*, and my cookie sheets were lined with parchment paper. You're only going to cook these until the bottom is slightly golden, so the parchment paper helps to get these cookies off the sheet quickly and prevents browning. 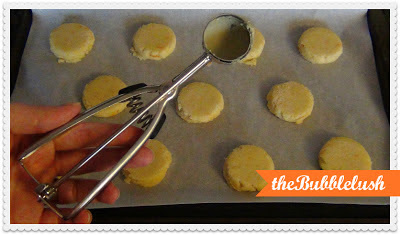 I use a small ice cream scoop so that the cookies are a consistent size. Since the dough was a drier style, I figured they wouldn't spread out very far. I used a flat bottomed glass bowl dipped in a small bowl of granulated sugar to flatten each ball to a consistent diameter. After baking I noted that the cookies didn't flatten much more, so smush to your desired size. The sugar just keeps the glass bowl from sticking to the dough. Each batch was baked for 10 minutes and the bottom was perfectly golden, but it might take up to 12 minutes depending on your oven. 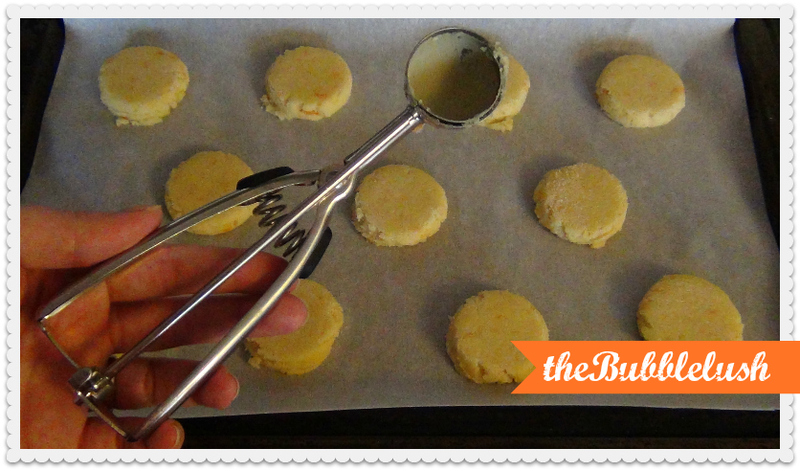 Don't overbake or they will be too dry. Once the cookies were baked and cooled on racks, I mixed up the glaze. I added the remaining orange zest to some powdered confectioner's sugar and thinned with orange juice until runny, but not watery. I tried to spoon the glaze over the cookies, but I found that I got better coverage if I just dipped each cookie's top into the bowl of glaze and tapped off any extra. Make sure you put the used parchment paper under the cooling racks to catch all the dripping glaze and make clean up easier. I let the glaze set up for an hour while Hannah napped, and the recipe made about 3 dozen cookies. I reserved 6 for Hannah and I to eat as a snack (Chris HATES citrus desserts) and boxed up the rest to bring to my husband's coworkers. They lasted 15 minutes, and got rave reviews. 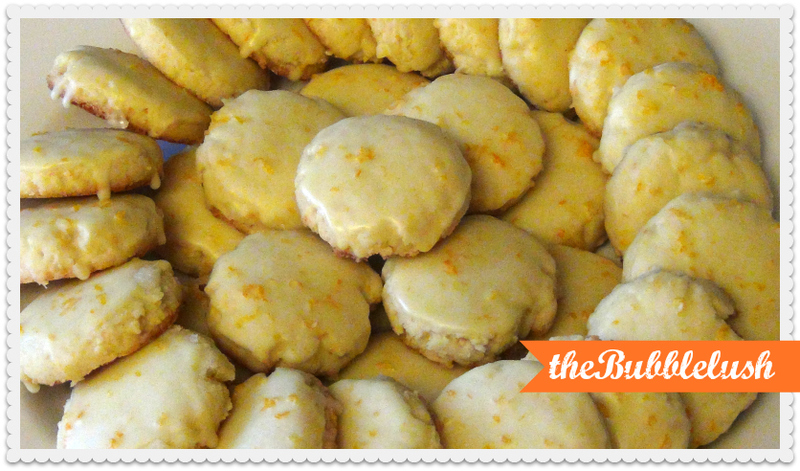 Not only are these cookies delicious with a bright citrus flavor, but they look beautiful with the zested glaze. 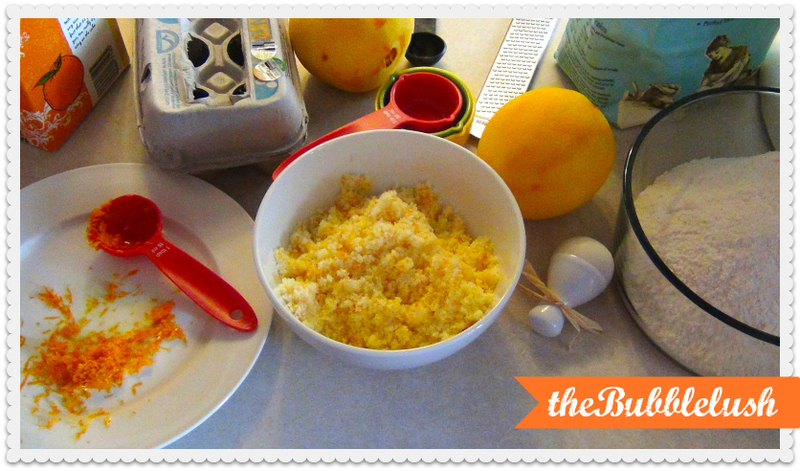 This recipe has made the cut and been added to my recipe book.